First of all what is a subtlety? A subtlety is a special dish. It is often a charade – something that looks like something else… something that is designed to delight the observer… sometimes something that is not even intended to be eaten. Now wasn’t that a Dainty Dish to set before the King. But what does this have to do with real food? Well this sort of presentation was a real part of top-of-the-line Medieval Feasts. The feast was not only supposed to feed you, it was also designed to delight and amaze, and show how truly important the host was. In order to accomplish this some amazing things were done. Was there ever a pie with blackbirds? Probably. A special crust would be baked – a bottom container and a lid to go on top. When it was time to serve the dish, live creatures, usually something like birds or frogs, could be safely placed into the bottom half of the crust, the lid put on and the pie served. When the lid was removed, the guests, anticipating some sort of meat pie, would be surprised and delighted by the live creatures emerging, like magic, from a freshly baked pie. Not very subtle by modern standards, but highly appreciated during Medieval times. Having read of some of the elaborate contrivances that were presented, and not desiring to risk any of the issues associated with live creatures, I was concerned about my ability to present something fun and unusual for a Tudor feast. I had the pleasure, a couple of years ago, of seeing a rather large castle sublety in the Arts and Sciences display at the Pennsic War in Slippery Rock, PA. The castle was built to scale out of individual shortbread bricks, glued together with something edible. It was stunning, but I knew that I did not have the time or resources to construct something that large or difficult to transport. My goal was something small and unique and easily transported. I had access to sugared violets, and I had made sugar paste confections and plates before, so my solution was a natural one. The Tudor feast was part of a Yule event, held in the higher elevations of northern Arizona in early December. What a more perfect interlude for the feast that to announce the miracle of spring brought forth in the middle of winter! Sugar, being relatively expensive during Medieval times, was often used in ostentatious displays of wealth during feasts. So I used a significant amount of sugar to produce sugar paste. The recipe that I used came from The Good Housewife’s Jewel by Thomas Dawson, 1597. The original recipe follows. To Make a Paste of Sugar, where of a man may make all manner of fruits and other fine things with their form, as plates, dishes, cups, and suchlike things, wherewith you may furnish a table. Take gum and dragant, as much as you will, and steep it in rose water till it be mollified. For four ounces of sugar take of it the bigness of a bean; the juice of lemons, a walnut shell full, and a little of the white of an egg. But you must first take the gum, and beat it so much with a pestle in a brazen mortar till it become like water. Then put to it the juice with the white of an egg, incorporating all these well together. This done, take four ounces of fine white sugar, well beaten to a powder, and cast it into the said mortar by little and little, until they be turned into the form of paste. Then take out of the mortar and bray in upon the powder of sugar, as if it were meal or flour, until it be like soft paste; to the end you may turn it and fashion it which way you will. When you have brought your paste to this form, spread it abroad upon great or small leaves, as you shall think it good. So shall you form or make what things you will, as is aforesaid, with such fine knacks as may serve a table, taking heed there stand no hot thing nigh it. At the end of the banquet they may eat all, and break the platters, dishes, glasses cups, and all other things, for this paste is very delicate and savorous. If you will make a thing of more finess than this, make a tart of almonds stamped with sugar and rose water, of like sort that marchpanes be made of. This shall you lay between two pastes of such vessels or fruits, or some other things, as you think good. Combine the gum tragacanth and flavoring in a bowl and mix until it becomes a runny paste. Add the lemon juice, the egg white and any food color that you desire until smooth. You may want to add a little hot water (a TBS or two) if your paste is not smooth, or if it seems too thick. Gradually add as much sugar as needed to make a smooth, kneadable dough. Sugar paste lightens in color as it dries, so make the dough a bit darker than the final color that you want. After the paste has been kneaded wrap it tightly in plastic wrap and let it rest for at least ten minutes. When you work with the paste remove only as much as you need and keep the remainder well wrapped to keep it from drying out. The paste can be cut with cookie cutters, or molded in molds or by hand. Dry on parchment paper, or a drying rack. Turn occasionally as they dry. Drying time will depend on the thickness of the piece and the humidity in the air. Make extra pieces – they often break during handling or transport. Also allow a couple of weeks for the item to dry – some pieces can be particularly stubborn. You can use purchased gum paste from a cake supply store, but it does not taste as good as the real thing. Many original sugar paste recipes use rose water as a flavoring. Unfortunately for many modern people rose water reminds them of soap, so I bowed to modern tastes and used peppermint oil instead. The Holy Roman Emperor Frederick II issued an order to his courtiers to have sugared violets prepared (1239), but no recipe is given, because, of course, they knew how to do it. Some versions of Hugh Platt’s “Plyne delites” say that dareioles (custard tart) may be decorated with sugared violets but they give no recipe. There was one recipe from slightly after 1600. 149. To keep Flowers all the Year. Take any sort of pretty Flowers you can get, and have in readiness some Rosewater made very slippery by laying Gum Arabick therein. Dip your Flowers very well, and swing it out again, and stick them in a sieve to dry in the Sun, some other of them you may dust over with fine Flower, and some with searced Sugar, after you have wetted them, and so dry them. Either of them will be very fine, but those with Sugar will not keep so well as the other; they are good to set forth Banquets, and to garnish Dishes, and will look very fresh, and have their right smell. Pick the best looking blooms that you can find, leaving a couple of inches of stem as a handle. The flowers must be clean and not sprayed with ANY chemicals. Wash them gently in cool water and dry gently with paper towels. Place some of the sugar on a clean plate. Beat the egg whites until they have become slightly frothy and, using the clean paint brush, coat the entire flower blossom with egg white. Do NOT dip the flower in the egg white, it will pick up too much egg-white and it will not dry properly. 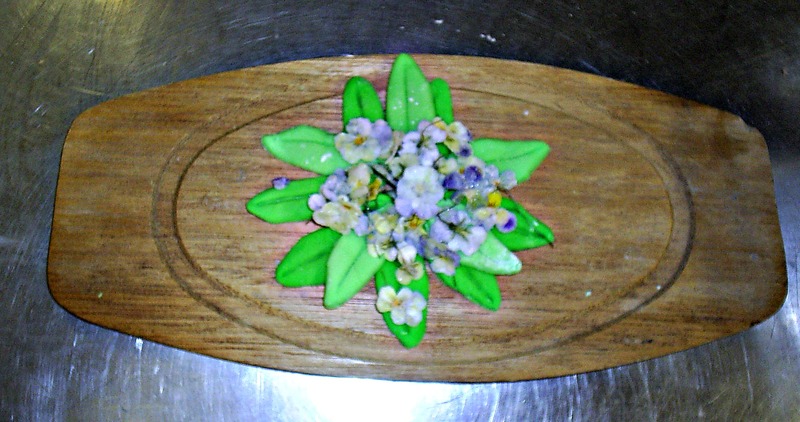 Lay the “painted” flower on the sugar covered plate and sprinkle on more sugar until every petal is covered. Gently shake off any extra sugar. Place the flower on a piece of parchment and cut the stem short. Allow the flower to dry completely and then place in an airtight container. The flowers will keep for several weeks. They retain an amazing amount of their color if you store them out of the sun, and they taste good, too! Each table was presented with a plate. 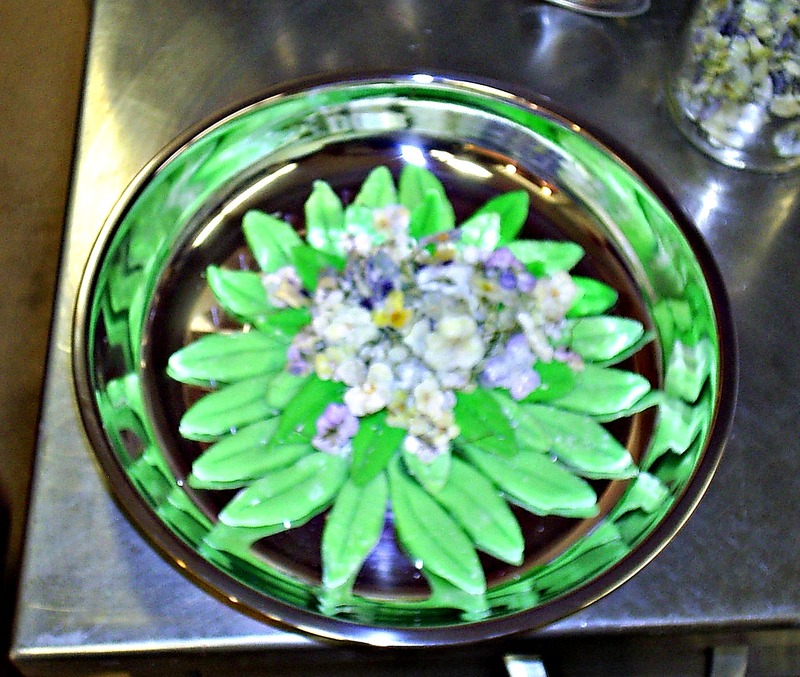 On the plate was a rosette of green leaves, and in the center of the green leaves was a small pile of sugared flowers. The violets have a faintly flowery taste, and the green leaves tasted like peppermint! The head table received a large “bouquet”. While the regular tables received wooden trenchers with smaller bouquets. The vast majority of the people at the feast had never eaten flowers, much less sugared flowers, and the peppermint flavored leaves were consumed with delight.